1.1 How do you know that all the Guns of Glory Cheats are scams? 1.2 How to get gold in Guns of Glory? If you’re on this website you’re most likely looking for Guns of Glory Cheats and Hacks. We don’t blame you. Guns of Glory is an amazing game for Android and iPhone that we love to play ourselves. It’s a very fun strategy game that can keep you occupied for hours but it can get quite expensive. The cheapest package of gold is not that expensive at only $0.99 but the wagon of gold will set you back a cool $100. We have put over a hundred hours into the game and spent over $300 on the game. Eventually we realized that we were spending more money on the game than was acceptable to use so we set out to find Cheats for Guns of Glory. However, this journey lead us nowhere. We couldn’t find any working cheats for Guns of Glory anywhere. You’re probably in the same situation. There are so many websites that claim they have cheats for Guns of Glory but none of them work. We became quite frustrated that there were so many fake cheats and hacks for Guns of Glory advertised on the internet. However, buried somewhere in the depths of the internet we eventually figured out a way to obtain free gold in Guns of Glory. That’s why we decided to create a guide in order to help other fans of the game who are also on the hunt for gold. Our guide will show you how to obtain gold in Guns of Glory legitimately without having to deal with fake hacks and cheats. How do you know that all the Guns of Glory Cheats are scams? We know that all the websites that claim they have Guns of Glory Cheat Codes are fakes because we tried them. We’ve tried over a dozen of these so called “hacks” and none of them added the unlimited gold to our account. The only reason these websites is exist is because they want to make advertising revenue. The websites that claim they have working hacks, cheats or generators for Guns of Glory try their best to look legitimate (see image below). This is simply so that you will believe that you can obtain free gold and they can get their advertising revenue. This looks like a legit Guns of Glory Hack, right? Wrong. The reason why nobody has been able to create a working hack or cheats for Guns of Glory is because the data about your account is stored on their servers. In order for hackers to add gold to your account they would have to hack into the servers of Guns of Glory which is nearly impossible. On top of that, if such a breach was actually realized and publicized it would be patched in no-time by the developers of the game because they would lose out on a lot of revenue. The only way you could actually hack the game is if you were playing on a modded APK version of Guns of Glory. However, this would not grant you any resources in the real game so is quite pointless. How to get gold in Guns of Glory? The legit way to obtain free gold in Guns of Glory was not easy to find. It took a lot of research and trial and error before we finally found a way to gain free efficiently. We have probably spent over 20 hours doing research into the topic in order to find this method. The method is completely legitimate and does not break the game’s terms of service. You do not have to worry about your account getting disabled or banned. Our guide reveals the methods that top tier players already use daily in order to obtain more gold. Do not lag behind any longer and get up-to-date with the number 1 way to get free gold in Guns of Glory. In addition the methods highlighted in our guide work on both Android and iPhone devices. Best of all, we’ve decided to release our guide for free. You do not have to pay a single penny in order to access our guide. Our guide is not as easy as pressing a single button and watching the gold flow into your account, because let’s be real, that’s simply unrealistic. What our guide will show is how to obtain gold efficiently and quickly. It does not take long at all to obtain the gold you need when you use the tips highlighted in our guide. 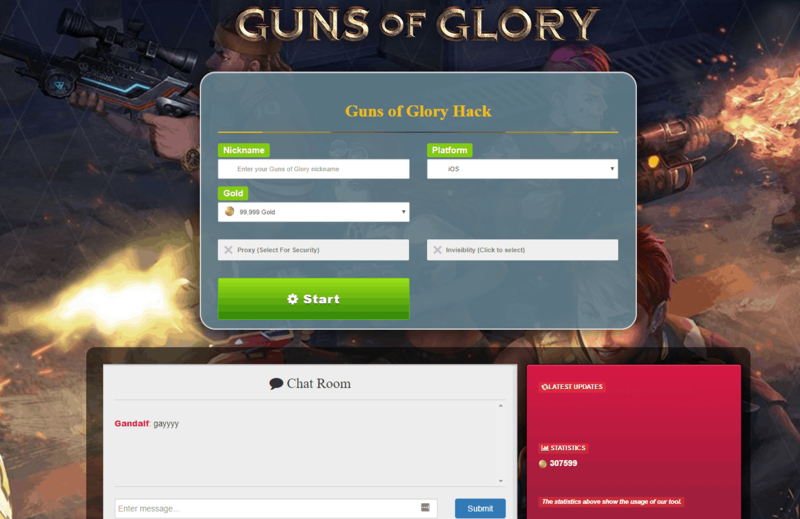 In addition, you can use our guide to obtain Guns of Glory Gift Codes which you can share with your friends to help them out. Stop falling for fake Guns of Glory Cheats, hacks and gold generators that promise you unlimited money and instead learn a stable, legitimate way to obtain free gold which you can use every day. Check out our free guide today by clicking the big blue button.